Welcome to the Millennium Cup, a local team competition involving the five tennis clubs of Streatham. You can find out everything about it on this website. The Millennium Cup provides friendly competition across all age groups over the summer. It helps to introduce players who may not ordinarily play competition to match play conditions on a level playing-field that excludes the participation of more experienced club players competing at Tennis Surrey League level. It is all about trying to win this lovely trophy. It was donated by the three inaugural clubs in 2001, Telford Park, Wigmore and Woodfield Grove. A beautiful crystal vase centre piece measuring 215mm in height and 145mm in diameter, the trophy is set on a wooden base with a silver sleeve. It has been won five times by Telford Park, four times by Wigmore and Grafton, while Norbury Park won it in 2018 for the third time. In 2013, Woodfield Grove‘s name was finally and proudly added to the honour list of champion clubs engraved on the sleeve. Woodfield Grove also won the Millennium Cup Masters in 2015, a special event celebration the 15th anniversary of the competition. 2019 sees the 19th edition of the Millennium Cup. It is as eagerly and enthusiatically contested now as it was when it was first inaugurated at the turn of the century. Many of those who have taken the plunge into match play in the Millennium Cup have gone on to represent their clubs in the Surrey Leagues. The competition continues to be a great grass roots development event for all. It is also great fun because it is friendly and everyone is sociable, both on and off the court! For all the latest on the 2019 Competition and the current Points Standings, click HERE. 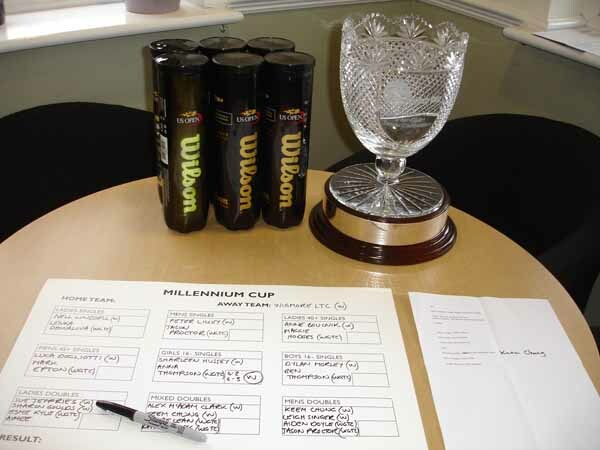 You can find the history of the Millennium Cup HERE, with all the results of past glories, while you can also download the Rules of the Competition and take a look at the photo Gallery. To learn more about the clubs participating in the Millennium Cup click HERE.